Along with breathtaking Caspian Sea views and streets filled with cafes, the 5-star luxury hotel Fairmont Baku, part of the iconic Flame Towers complex, brings 299 superbly appointed guest rooms and suites and 19 serviced apartments including Fairmont Gold. Guests will enjoy the city's most exquisite dining from authentic French Le Bistro to elegant Nur Lounge Bar. The hotel offers over 2,500 m² of function space and a fully equipped health club and SPA. Location, part of the iconic Flame Towers complex offering easy access to premium shopping and entertainment centre, featuring views of the Caspian Sea. 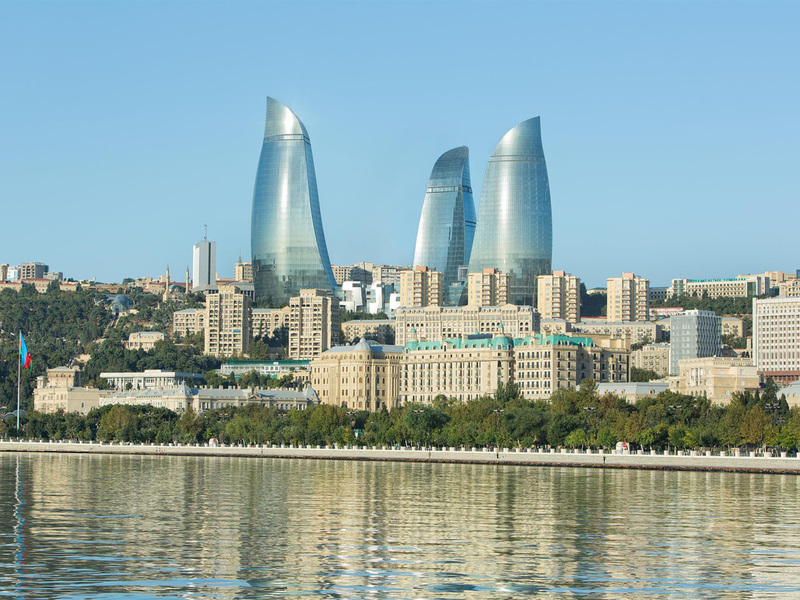 Easy access to Baku Boulevard a 5 km promenade along the Caspian shoreline via funicular or walking. Fairmont Baku offers 299 spacious well-appointed guest rooms and suites as well as 19 splendid apartments. Spectacular views of either the surrounding city or the Caspian Sea, magnificent amenities and anticipative service ensure a supremely comfortable stay that will not be forgotten. Le Bistro Restaurant has an eye-catching open kitchen where our Chef presents Azerbaijani cuisine with international dishes . The terrace of the restaurant is a perfect place to experience delightful desserts and the extensive wine list. The Jazz Club features live music on weekdays and mixes of talented DJs creating an incomparable mood all over the dance floor on weekends. The bar offers a light bites menu along with club's signature seasonal and classic cocktails. H2O has become known for famous panoramic sea and city views from the 5th floor, guests can enjoy light meals, ice teas and coffees. With a fun and lively atmosphere, this pool bar and lounge is ideal for cooling off with a refreshing cocktail. Nur offers an elegant and stylish setting for guests to enjoy signature cocktails and light meals. During the day guests will relax with our specialty teas. Our signature cocktails and live pianist will help you relax and enjoy your evening.